Feeling overwhelmed? To Do lists out of control? Want to be get organized? Try Trello! When I stumbled across Trello, I knew right away it was the tool for me. It’s much more visual than most To Do list applications, and it makes sharing and collaborating on tasks easy. When you visit the Trello website and sign up for a free account, the first thing you’ll see is the Welcome Board, with some simple tips to help you get started. Take a quick look and you’ll see what I mean by simple. It’s intuitive and doesn’t require learning a complicated productivity system. Boards are much like the corkboard you have on your wall, but they’re online. You can pin cards to the board in columns, called lists, and then the fun really begins. You can add colored labels to your cards so that you can sort or filter them, give cards a due date, attach other files and checklists to them, and, if you’ve shared the board, you can assign them to other board members. It’s also easy to search for a card by keyword, filter cards by labels, or choose to display cards for one or more board members. You can create as many Trello boards as you like, but I decided to create a single board for all my work projects, so that I could see at a glance all the projects I’ve committed to. I use the colored labels for clients, which lets me view just the tasks I need to do for a single client if that’s what I need to see. Trello comes with three lists built in – To Do, Doing, and Done – but you can customize these by adding or removing lists, or renaming them. This gives you the freedom to use whichever productivity system you like. For now, I’m happy with the existing lists, although I add a date to the title of my Done list, and archive the list each week so that things don’t get too cluttered. Archiving hides the list, but it’s still there if I want to reopen it later. As each new project arrives, I add a card to the bottom of the To Do list. Each morning, I look at my tasks and reorder them based on their priority. Reordering is as simple as dragging and dropping cards up and down the list. Once I’ve decided on the priority, I choose which card I’m going to work on next. I drag that card to my Doing list, and that’s the task I concentrate on. When I’ve completed a card, I drag it into the Done list and give myself a pat on the back. By the end of the week my Done list contains all the things I’ve accomplished. What else do I like about Trello? It works on my iPad, which is handy in the weekend when we’re working on projects around the house, and there’s an app for the iPhone/iPod Touch, so you can take your Trello boards with you. See the big picture of everything that needs to be done. Choose to work on a single task at a time, which frees me from worrying about all the other things on my To Do list. See a growing list of tasks I’ve completed, which is surprisingly satisfying. What about you? Have you tried Trello? Or do you prefer another tool for keeping organized? This entry was posted on Wednesday, January 25th, 2012 at 8:53 pm	and is filed under Time management. You can follow any responses to this entry through the RSS 2.0 feed. You can leave a response, or trackback from your own site. I tried trello, but i stopped using it because of its inability to divide columns into swimlanes. As a technical lead i can’t see what good a list of tasks can do for me without being able to slice and dice it in different dimension. 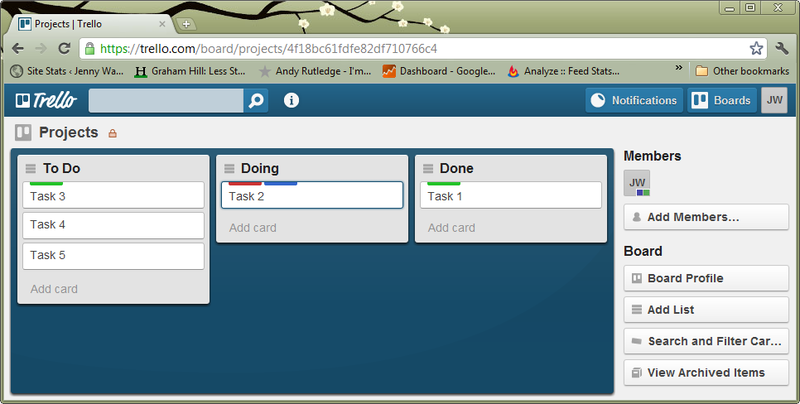 The latest version of Jira supports kanban boards with dynamic views. I started using it let’s see how it goes. Are you still using trello? 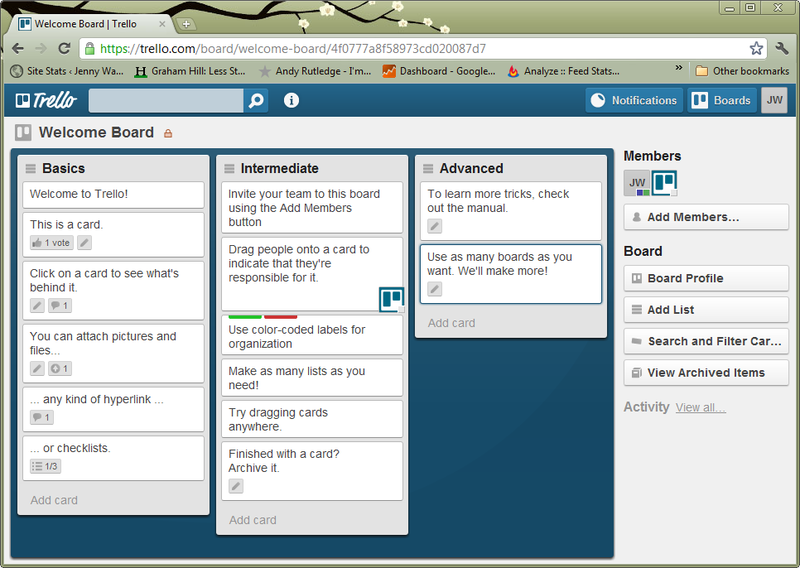 Yes – I’m still using Trello. It’s simple and that works for me. But I’m a team of one, and I can imagine that if you shared a Trello board with a team, you could end up with lots of tasks and you’d want a way to quickly sort the cards. If you’re not already using Labels, you could use those to set the priority of your cards. You can filter by Label, so that would let you see just the critical cards. I had a quick look at GreenHopper (is that the JIRA kanban tool you were talking about?) and it does look cool. Will you let me know how it goes for you? Yes i use GreenHopper and it works very well for me. But you are right, for a one man team, trello or wedoist.com is fine. I just discovered Trello yesterday (how did I not hear of it before this, I don’t know) and I am using it for homeschooling for each of my kids to show what assignments they have to complete, which they have completed and which they are working on or ones they need help with. It’s almost perfect for the job. So happy I came across it. One way to create “swimlanes” for class of service, or some other division is to use labels. You can then filter the board to view each “swimlane”.